The importance of Brecon as a military centre began to grow soon after Victoria became Queen in 1837. The Barracks in the Watton began as an armaments store in 1805, but many more buildings were added between 1842 and 1844. The new buildings from this date included the Officers Mess, Sergeants Mess, Commanding Officer's accommodation and a military hospital. These were built in stone along the north side of the Barracks Square. Cavalry and Infantry barracks were also built at this time. 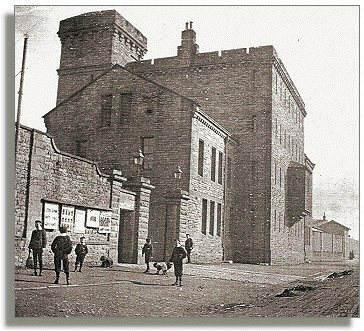 This photograph shows the Keep at the entrance to the barracks from the Watton, which was completed in 1879. The 24th Regiment of Foot became famous for their exploits at the battle of Rorke's Drift in 1879 during the Anglo-Zulu Wars. The Brecon Barracks became the permanent headquarters for the renamed South Wales Borderers when the the Army gave regiments territorial titles in 1881.
for more information about these famous regiments and their history.